Copyright: You will retain the copyright in all photographs submitted for entry into the competition and you agree to grant to the Promoter a worldwide, perpetual, irrevocable licence to use images contained in the photographs in any of its publications, advertising inventory, websites and/or promotional material associated with the competition. Whatever made you fall in love with your city, here’s your chance to show it. 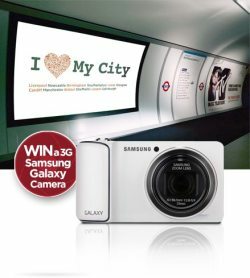 The best entry will win a Samsung Galaxy digital 3G camera, and will be exhibited in front of millions of London Underground commuters on CBS Outdoor’s digital screens. To enter the competition, simply upload a photo you’ve taken and enter your details before the closing date of 29th March. A panel of judges will choose the photo that best demonstrates city love for each of the 12 cities. Your image will be exhibited in front of millions of London Underground commuters on CBS Outdoor’s digital screens. The judges will select a shortlist of their five favourite entries from each city including one overall winner from each city on or around April 8. You are permitted to submit up to 10 photographs per city for entry into the competition. Your photographs must have been taken no longer than 6 months prior to the closing date. Online submission of digital photographs via the website. Image requirements: JPG format; up to 5 Mb in file size. how well, in the Judges’ opinion, the entries encompass the brief on the competition websites.